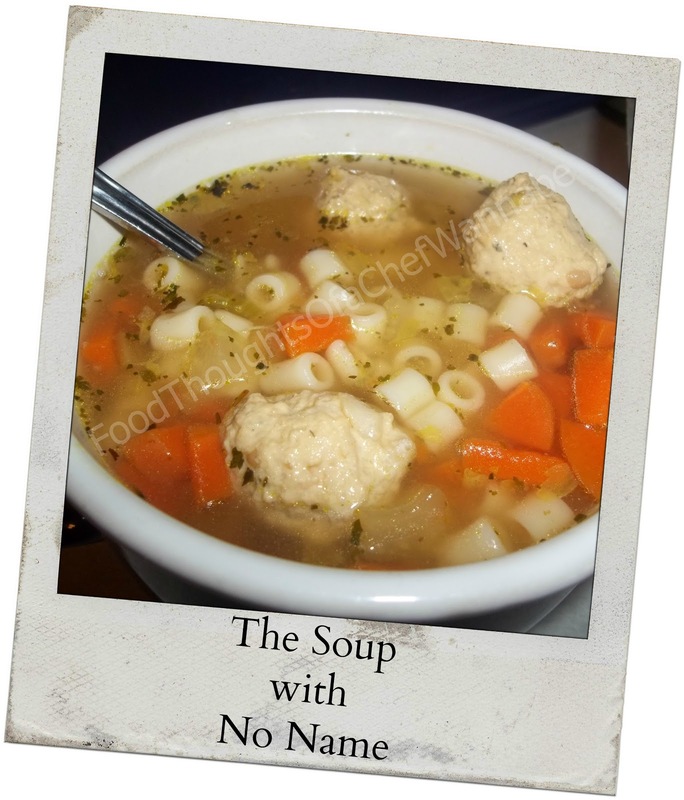 FoodThoughtsOfaChefWannabe: The Soup With No Name! The Soup With No Name! Funny how this happened. I have never speed blogged before, but I wanted it written down so I thought I might as well just do it! For those of you who do not follow on Facebook, this is how this happened. I posted a photo of my cup of soup I was having for lunch. People kindly said it looked good and then, they got ugly. They started DEMANDING a recipe! (jk jk jk) They asked nicely for a recipe and it actually never occured to me anyone would want it. I never really wrote it down. So, since I am typing up this random, completely hurried blog post, I need something in return. I need a name for this soup! I love it, and it is so easy, I will make it forever! So leave a comment below, and tell me what YOU would call this soup! In a large pot, add in stock and finely chop all vegetables. Let simmer covered for 15-20 minutes. Combine ALL ingredients and roll into mini meatballs. Bite size is best! Bring broth to a boil and drop them one by one carefully into your soup! After they are all in the soup, cover and let simmer another 10-15 minutes. I make my pasta seperate these days. Especially if I have a huge pot of soup, I don't want the pasta to bloat or get mushy. Gross! I made ditalini because it is my favorite soup pasta. YUM that looks good.... and I think fast blogs are the best as you are writing exactly what you think... I am not good at naming recipes as you can see on my own recipes... but YUMMY! Veggie Meatball Soup would be my name ~ see not too much imagination on my part. Thank you both! I am usually a girl who speaks/types what she thinks, I just had to do it quicker and more careful, no time to proofread or make sure I hadn't said something unladylike. LOL Hope you both try it and enjoy it! Thanks so much for reading! It is a pleasure having you! Gonna make this tomorrow cause it is really cooling off and it will be a good day for soup! I think I may add a little spinach. Love Ditalini pasta too! So glad you are planning to make it. It is incredibly similar to my Italian wedding soup. I just took out the spinach and changed up the pasta. I also do my meatballs a bit different for Italian Wedding Soup. Let me know how you liked it!! Thanks for reading! Looks Yummy! Can't wait to make it. I will add some spinach. Thank you so much for sharing. Making this today!!! Taking some to my Mom tomorrow. This is a good alternative to regular chicken noodle soup. Love your receipes! Keep'em com'in! Making your soup today! Sharing with my Mom tomorrow. Good alternative to regular chicken and noodle soup. Adding spinach too. Excellent!! Let me know how you like it! Thanks for reading! Good call Coop.......good call. So which one?